We went to Florida last week. It was a spur of the moment thing brought on mainly by the cold weather. I love going on trips so I was more than ready to pack what we needed. It did not take me long at all, just two hours to make sure we had everything we need and that was while making sure that the house was secure and clean before we left. We had a good time. It was a happy and fun vacation and we would like to go again, tomorrow if possible :) The weather was beautiful there and there was a lot of fun things to do. 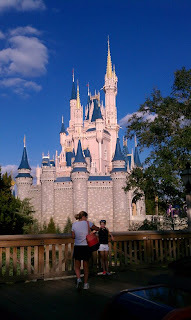 One thing is to visit Disney which we did albeit only for a few hours because my crew were not happy and comfortable but I was still able to take good pictures of some things like the castle below. Beautiful, isn't it?